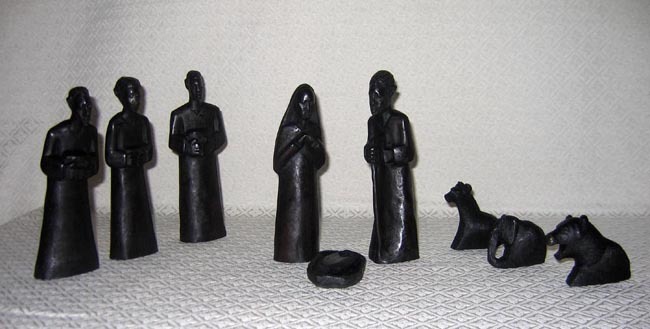 This Nativity set was hand-carved from ironwood by Abel Joseph Juma. He lives in Beira, Mozambique. He learned to sculpt wood from his father while they were living in Malawi as refugees during the Mozambican civil war. His father always sculpted as a hobby, but as living conditions became more expensive and as he started his own family, Abel began to sell his work to make a living. The standing figures are approximately 8.5 inches tall. The manger and baby Jesus are at the foot of Mary and Joseph and are two separate pieces. The set includes three animals: a zebra, an elephant, and a lioness with her mouth open (run Baby Jesus, run!). Abel mostly uses ironwood for his work. He buys his wood in Nhamatanda, a district some miles away. He also occasionally buys his wood from farmers. He used to go into the bush to find wood for his work. When he went to the bush or jungle, it took three days: one full day to walk to the bush, one day to gather the wood, then another full day to walk home. Abel is the oldest of 6 children; they are orphans. Their parents were killed in a car accident in South Africa several years ago so he has been the breadwinner for the family since that time. He is 27 years old now. About 18 months ago, he bought a bicycle so he could take his carvings to several locations in the city. This blessing of having enough money to buy a bike came by one of our Care For Life volunteers that paid him to teach her how to carve. His sister died in 2005 and he had to pay for the funeral, so he sold the bicycle to cover the costs. He rents a small mud home that has no electricity or running water. Education is a priority for him so he has tried to keep his younger siblings in school. Abel speaks English and 10 other languages (mostly native dialects).